It’s become a bit of a tradition for our family to travel west from our Ohio home on our annual summer vacations. We usually tend to focus on one or several national parks, making the trip an outdoor adventure. But this year, we tried something else—doing a sampler platter of sorts across the wide expanses of New Mexico. 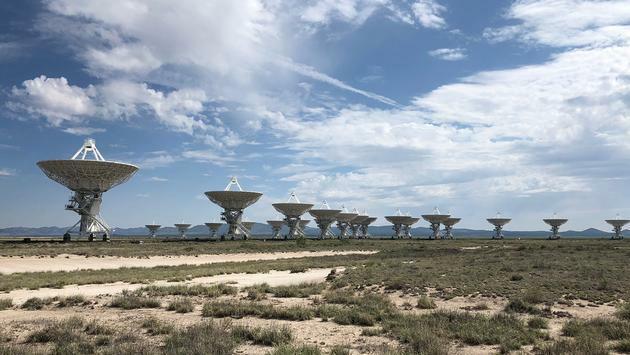 If you’re a fan of the Jodie Foster movie Contact, you’ll recognize this iconic grouping of radio telescopes strewn across the New Mexico plains, set about an hour west of Socorro. Dedicated in 1980, The VLA uses 27 dish antennas that move along railroad tracks and can span a 22-mile distance in a Y-shaped configuration. Computers combine the signals from all the telescopes into a single image, essentially giving the resolution of a 22-mile diameter instrument. The setting of the VLA is nothing short of dramatic. Sitting on a broad plain ringed by distant mountain ranges in every direction, you’ll often see thunderstorms raging in the distance. And the precision separation of the telescopes makes them appear as some sort of technological artwork, receding into the distance at perfect intervals. There’s a small visitor center and a self-guided walk that you can take, allowing you to stand beneath one of the 82-foot diameter beasts. I highly recommend the 15-minute film about the VLA’s history and expansion, wonderfully narrated by Jodie Foster (of course!). Guided tours are offered on the first Saturday of every month at 11 a.m., 1 p.m. and 3 p.m. There are also night sky telescope viewing events on those first Saturday evenings at the campus of New Mexico Tech in Socorro. 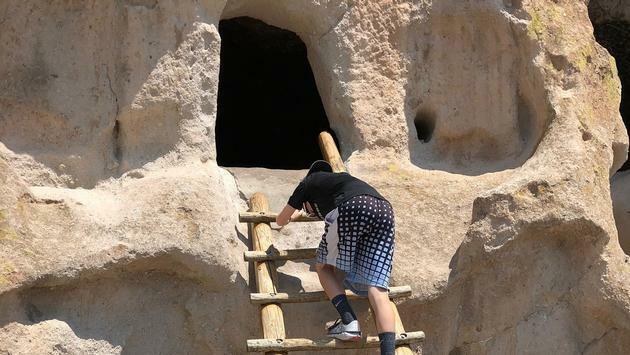 If you’re staying in Santa Fe, a day trip to Bandelier is a must! About an hour’s drive toward Los Alamos, this national treasure is set in Frijoles Canyon, where ancestral people lived on both the canyon floor and also high up the sheer cliff faces at different times. The 1.2-mile loop hike from the Visitor Center is a lovely one, and it takes you through the excavated sites that sit on the valley floor. I highly recommend picking up one of the trail maps at the center, as they explain so much about these people, why they lived where they did, and what traditions they held important. As the trail starts to make its way upward toward the cliffs, you can see pockmarks in the cliff face—small cave-like rooms where they lived. Ladders provide access to these small rooms, which maintained cooler temperatures than the valley floor, and you can enter many of them. You can turn around for a stunning view of the excavations in the valley—and you’ll get a better appreciation for the overall structure of the place. Due to the sensitive nature of the park and the few roads there, visitors are required to ride free shuttles into the park during the high tourist season. Board shuttles at the White Rock Visitor Center in town. The ride takes 15-20 minutes, and there is ample parking around the center. 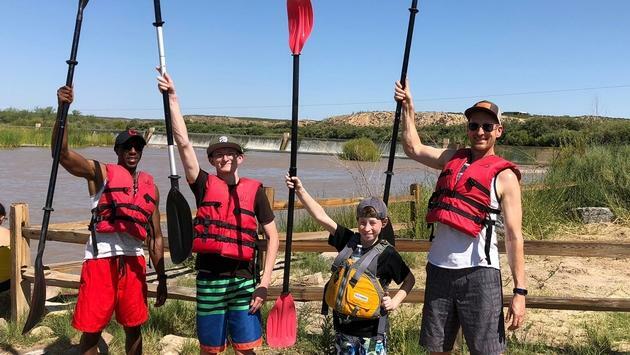 One of our most enjoyable adventures of the trip was kayaking down several miles of the Rio Grande near Las Cruces. We met David Crider of Southwest Expeditions at Leasburg Dam State Park, north of town early in the morning, to avoid the worst of the blazing sun. His tour company offers both hard-shelled kayaks and inflatables. Although we ended up choosing the inflatables, in retrospect I found them a bit more challenging to steer—I’ll go hard-shelled next time! Still, we had a glorious, leisurely trip down the river, taking about two hours to go several miles. David was a great guide, and we chatted about his company, which ran tours for 650 people last year and had already hit that number by midyear 2018. They’re about to start up some interesting sounding paranormal tours and history tours. There is a lot of history in this portion of the state, from Billy the Kid to petroglyphs. Also on the horizon are camping trips for families and an outdoor expo and quadrathon in 2019. We hit this amazing landscape while driving from Las Cruces to Roswell—and it was definitely a unique experience. Huge sand dunes of gypsum range over about 275 square miles, giving this part of the state an otherworldly feel. Stop at the Visitors Center for some geologic history and then take the 16-mile round trip “Dunes Drive” to get up close and personal with the dunes. You can walk up and over the dunes, which make for some fascinating photo opportunities. A popular pastime here is sledding down the dunes. You can purchase small round sleds at the Visitor Center, but we found the experience pretty disappointing. Even waxing the bottom of the sleds did little to help, and the kids gave up after a few minutes. 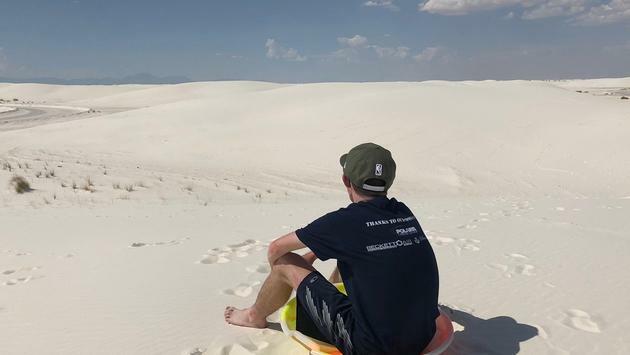 There are camping opportunities at White Sands, and for those with more time, you can bicycle, go horseback riding, or even take a ranger-led full moon nighttime hike.